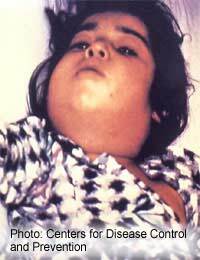 Diphtheria is an acute infection of the upper airway. It is highly contagious and must be treated before the symptoms are permitted to escalate which can have a very negative impact on life.It is most commonly passed to others through sneezing, coughing or through contact with mucous; it can also be contracted through skin contact as well though this is less common. Although most people may have heard of diphtheria and know that it used to be a very common illness in the past, they do not know much about it. It is actually caused by the diphtheria bacterium and other toxins that attack the respiratory system, gradually causing severe respiratory distress and can easily cause death if left untreated. The bacteria enter the system and grow quite happily among the tissues of the throat which provide a perfect environment as they are dark, moist and warm. As the bacteria multiply, they emit a dangerous toxin that is very hazardous to health as it destroys healthy membranes and replaces them with a covering which can eventually come loose and prevent inhalation and exhalation causing death. Along with this the toxins can be absorbed into the body causing irreparable damage to the cardiac tissues and parts of the nervous system. The first stage of diphtheria can cause a sore throat and inflammation of the throat tissues. Along with this discomfort comes along with a cough and head cold often with an increase in temperature. As the disease progresses people find it increasingly difficult to breathe.If left untreated victims of diphtheria can eventually die of lack of oxygen due to a film of membrane that grows over the opening to the airway at the back of the throat. This sheath usually spreads from around the tonsil site of one side to the tonsil on the other side. If the bacterial toxins affect the skin, small crusty scabs can form that can grow to be quite large and quite deep affecting the deeper layers of tissues. In order to make a complete recovery, diphtheria should be treated as a matter of urgency and will often force medical personnel to act because of a hunch or suspicion not waiting until an official diagnosis has been made using blood tests and swabs.Anti-biotic treatment is essential along with receiving specially developed medication that counteracts the toxic effect of the diphtheria bacteria. If you have any problem with breathing, specialist breathing apparatus may be used to assist breathing until the medications have had time to work. Anyone with suspected diphtheria should inform staff of anyone they have had contact with in the past five days as it can spread so easily and quickly in those who have not been vaccinated. As diphtheria caused so many deaths and illness in the past, it is recommended that everyone is vaccinated against the disease in order to protect themselves. The vaccination involves injecting a very small amount of the disease into a person whose own immunity responds to the tiny dose and creates its own antibodies to the disease should it ever come into contact with it again. The vaccination programme has worked very well and the incidence of the illness has dropped to virtually none in the Western world. Diphtheria has been responsible for many epidemics and deaths in the years gone by, but now thanks to vaccination programmes the disease is very rare. @Ill bitc - if you have acid reflux, then you should not eat or drink any acidic foods which makes this worse. Citurs fruits, grapes, wine, apples, are all acidic, you can look on the GERD website to find out what these foods are. It may take time, but it should clear your problems. Otherwise, if it doesn't alongside taking proton pump inhibitors - your doc should send you for tests. I have very bad acid reflux and COLD . For about 4 years my voice has gotten very horase. It's non stop and people cannot understand me .Any suggestions?